Artist Archie Rand took on a very ambitious project: he painted all 613 Jewish commandments. These images have been published in a book “The 613 by Archie Rand”, which will be published November 10th by Blue Rider Press. More publication info here. Archie Rand’s career as an artist spans five decades and myriad themes and genres. Among his pioneering explorations, The 613 is surely one of his most ambitious feats yet. Without any idea where the work would be exhibited, Rand began transforming each and every one of the 613 mitzvahs, or commandments, into its own breathtaking painting, a series that took five years to complete. Each of the panels features a vibrant, unexpected image that brings forth the heart of its law and commands our eyes to linger. 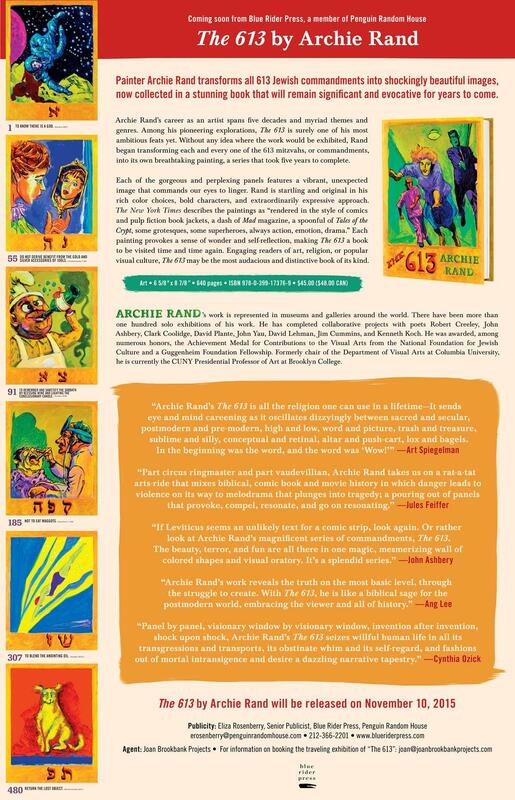 Rand is startling and original in his rich color choices, bold characters, and extraordinarily expressive approach. The New York Times describes the paintings as “rendered in the style of comics and pulp fiction book jackets, a dash of Mad magazine, a spoonful of Tales of the Crypt, some grotesques, some superheroes, always action, emotion, drama.” Whether grotesque or dramatic, each painting provokes a sense of wonder and self-reflection, making The 613 a book to be visited time and time again. Perfect for readers of art, religion, or popular visual culture, The 613 may be the most audacious and distinctive gift book of its kind.